Gemstone Organic is the most perfect example of what kind of magic can be created from absolute authentic intention, passion + love. 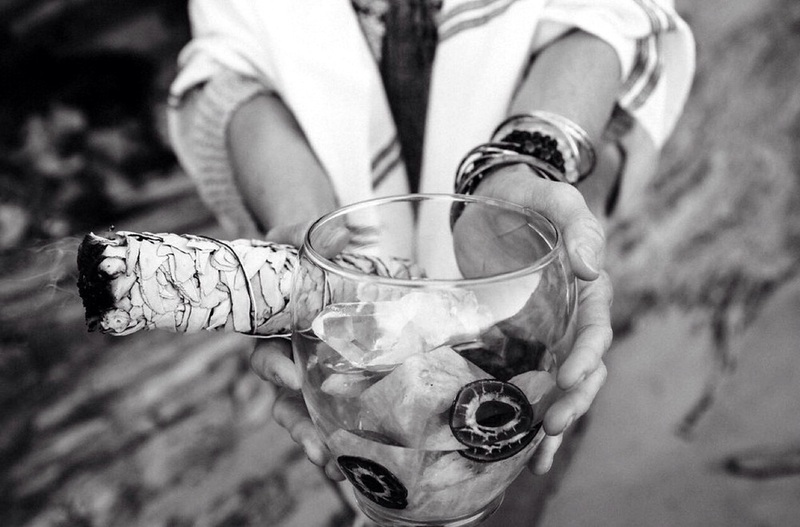 Debra, Founder + Chief Alchemist and Sara, Earth Warrior + Chief Sorceress are the duo behind this magical alchemy. These women are incredible. The dedication to their craft inspiring. And the ultimate result intoxicating. 100% organic, raw, food-grade edible, handcrafted skincare combined with the healing vibrations of powerful gemstones + crystals, equals an infusion of revitalizing plant medicine and earth, fire, water, + air energy that both balance your chakras and nourish your skin. WOW. Deb and Sara first crossed each others paths in 2004 and went on to link arms as business partners in 2013. When you meet these two in person, it is SO beautifully obvious that they are soul sisters, in addition to moon mother and daughter. Debra's love for Mother Earth began in her childhood years whilst collecting rocks in the gravel pits of northern Minnesota. Over time, she continued to nurture her love for all of nature's plant, gemstone, and spiritual offerings, along with her passion for crystals and earth-medicine. All this knowledge and love ultimately culminated in her healing recipes for health and body care. She is also a Shamanic Reiki Practitioner and a skilled leader inside ceremony. Sara was born an Earth Warrior, has been a vegetarian and activist since the age of 10, and continues her mission to care for Mother Earth and all her creatures. But it was her Mama and Papa's battles with cancer that fueled her journey towards a non-toxic, holistic and preventative-medicine lifestyle. When she found Debra + Gemstone Organic, "she knew immediately that she was meant to be the voice of this cosmic skin & soul revolution". She also brings her background in energy medicine, gemstone healing and gemstone jewelry. I have been using Gemstone Organic for some time now in my own healing and skin care ritual. I adore their products and use their Jade Creme and Rose Quartz Creme daily, along with the Lavender Gem Juice during my meditations and to prepare myself for sleep. I had the opportunity to test out a few early formulations of their newest addition, the Sun Stone Body Lotion and it is VIBRANCE IN A BOTTLE. These are the type of products that once you try them, they will become lifelong companions. Were you introduced to wellness at a young age or come across it later in life? D :: My aunt started me on the wellness path at an early age with her love of herbs, vitamins, healthy food and her love of nature. S :: I became passionate about earth at a young age, choosing to become vegetarian at 10 years old. It took me many more years to care as much about my personal health as I did for the environment. D :: I always carry Rose Quartz with me, no matter what. But Agates were my first love and will always be my favorite. S :: Such a hard question, but Sunstone was the first crystal to really speak to me and will always hold a special place in my heart. D :: Myrrh. I love all the dark, sultry and woody scents the best. S :: Blue Chamomile. It just makes me (and my skin) feel happy. D :: Sunrise walk on the beach, dancing/song with Sara, being stopped randomly on the street or in a restaurant by someone who loves Gemstone Organic, creating gem essences, dinner in the glow of the golden hour. S :: I would say my perfect day starts with a morning (kundalini) song with Deb, making lots of exciting new connections to people through Gemstone Organic - like when we found you! Eating lunch outside in the sunshine. And brewing up some garden hydrosols at night. What is a typical breakfast? lunch? dinner? snack? BREAKFAST :: our typical breakfast is soft boiled eggs, paired with a micro greens salad. LUNCH :: is something like a collard greens wrap, filled with sprouts and veggies from the garden. DINNER :: we love our Indian curries with extra extra turmeric! SNACK :: is a cashew shake we make with homemade cashew butter, dates, cinnamon, nutmeg and vanilla and of course fresh turmeric when it's in season. We can never get enough turmeric! What is your absolute favorite indulgence? D :: Great company, conversation, music, and view over an expensive bottle of wine. S :: Dancing till the sun comes up. S :: An Italian feast: all the carbs, cheese and garlic I could ask for. Do you have a favorite Summer meal or recipe that you'd like to share with us? Where is/are your most favorite place/s to be on this earth? S :: The sulfur springs on Ometepe, a volcanic island in Nicaragua. To me, it's paradise. D :: My mom and her unconditional love. Anyone who is dedicated to change the world in their own way. S :: People who can drop everything and chase after their dreams, no matter what society thinks of their chosen path. What daily rituals are non-negotiables for you to help keep you balanced and centered? D :: My morning meditations and gratitudes. S :: Inversions. Getting upside down daily is so big for me. Keeps my perspective in check! What professional beauty | fitness | health gurus are you inspired by? We run into gurus and teachers everyday when we stay present. There are lessons and inspirations everywhere. We especially admire people who can listen to their intuition, follow their hearts and walk to the beat of their own drum. Health crazes come and go, but we have to learn to listen to our bodies and our individual, unique needs in order to truly find wellness. Please share with us a favorite beauty secret, tip, or product? Facial steams! Simmer some herbs in a pot of water (calendula, rose petals, sage..) and then pour into a bowl. Sit with a towel draped over your head and let the steam surround your face. It's an inexpensive daily ritual that keeps your skin soft and gives you a beautiful rosy flush. What do you do to relax? Do you have a daily practice? D :: I love to walk along the ocean, daily if I can. And singing kundalini music is a must. S :: I like to take what I call 'chakra baths'. I design the bath with corresponding gemstones, essential oils, and music in hertz that match the chakra I'm working on. What is your favorite mantra that you live by? S :: Be love; it's all we are. What is the latest book on your nightstand? S :: Currently it's a journal as I've been trying to write more poetry at night. Share with us 3 songs on your current playlist?